My trip to Greywalls was not only my first trip to Marquette, it was my first visit to the Upper Peninsula of Michigan. In some ways, the UP as it’s often referred to, feels like a completely different country. Maybe it’s because it’s so remote. It could also be because much like I find in Canada, everyone I met could not have been more welcoming. Another factor was some of the relatively unique conversations I overheard. For example, two friends meeting in a local restaurant were discussing their anticipation for the snow to arrive so they could start snowmobiling. Seems like a perfectly reasonable conversation…until one factors in that this conversation took place in early August. I also heard locals waxing poetically about a coed hockey tournament named the Ball and Chain that had to be canceled due to excessive alcohol consumption. While visiting the U.P. is like visiting a foreign land, navigating to the Greywalls course is also like entering its own little world. 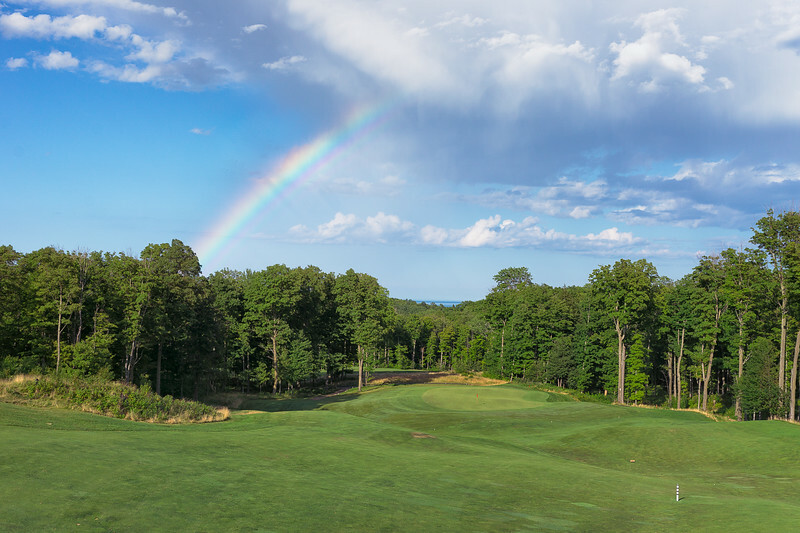 When you drive into the Marquette Golf Club you’ll wind through the original course there, the Heritage, which is a great course in its own right, but a traditional layout on relatively benign terrain. After parking and checking in at the pro shop, you’ll drive five minutes or so to the first tee. On the way there, you’ll see a handful of holes from the Greywalls course and it quickly becomes evident that this course is nothing like its sister course, or like any other course you’ve seen. After winding through the forest and arriving at the first tee, you’ll look down the fairway to see Lake Superior several miles in the distance. While lake views are always nice, they are not the main attraction at Greywalls. The golf is so spectacular that it’s possible (though not likely) that one could play the entire round and not even notice the largest freshwater lake in the world out in front of them. Sound like a spot worth visiting? Read on for more of the details. 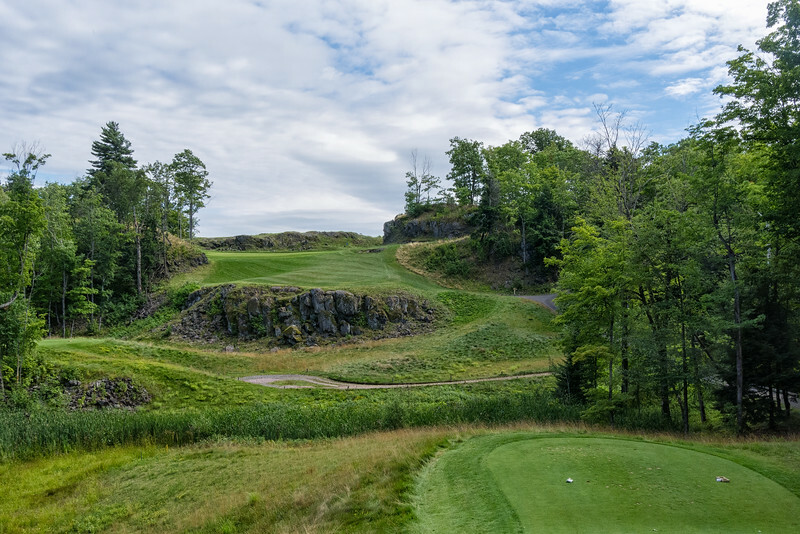 The terrain on the front nine is best described as “rugged.” With Lake Superior gleaning several miles in the distance, you’ll play through the forest, around huge rock formations, and up and down several large hills. The back nine calms down a bit is a bit more rolling in nature, as opposed to what feels like a roller coaster ride on much of the front. If this has made it sound like the course is too difficult, I wouldn’t fear. By no means is the course easy; it feels like the type of track that will challenge the accomplished player but won’t beat up most novices. It’s fairly open off the tee plus there are multiple sets of tees to accommodate those who don’t hit it a mile. 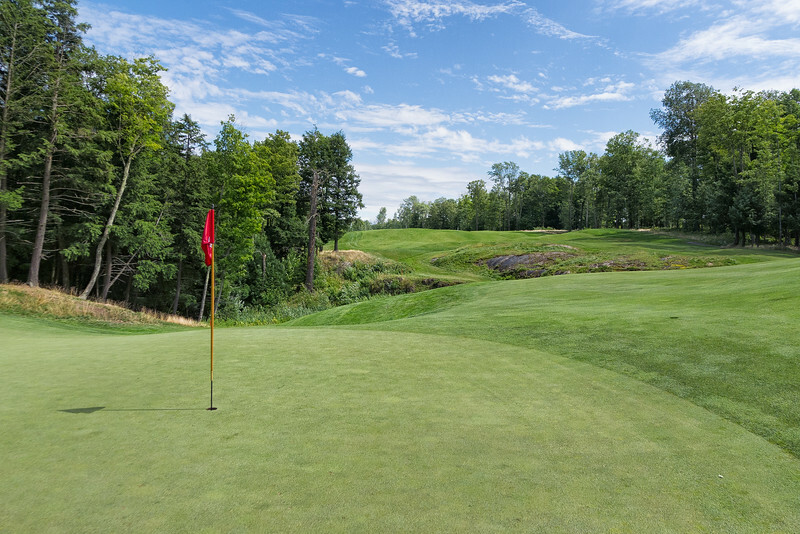 Part of what makes Greywalls so spectacular is the natural feeling of the golf course. Many modern layouts might look spectacular but aren’t at all natural and are surrounded by houses that take away from the experience. 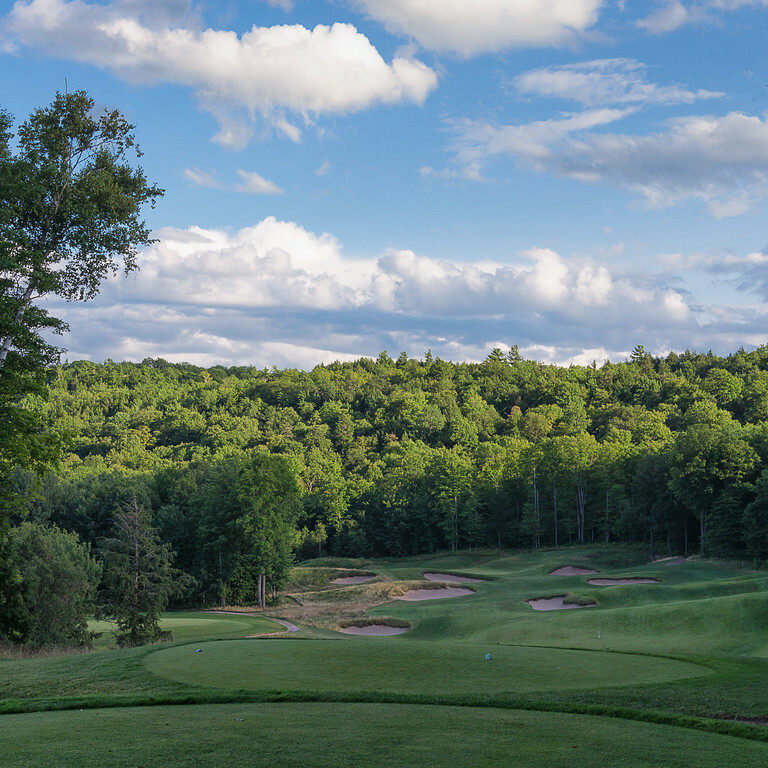 Not only do you feel removed from the rest of the world while playing Greywalls, the course simply feels natural; almost like it was meant to be there. While the terrain is crazy in spots, you’d never say it was tricked up. Even though the two courses couldn’t be different in many ways, Greywalls reminds me a lot of Royal Dornoch. Both tracks are built on terrain so gorgeous that I’d enjoy walking them even if I wasn’t playing golf. You’ll just look around in amazement many times throughout the round. Another aspect of the layout that I enjoyed a great deal were the tee shots on many of the holes. While most of them are fairly straightaway, there are still choices to be made from the tee. The fairways are generally wide enough that you can just aim down the middle, but playing the course multiple times gives you a better appreciation for the number of strategic choices available to more aggressively attack the hole. The 11th hole (pictured below) is a perfect example of this with its bunkering. I’m still not sure the best way to attack this hole, which in most cases would frustrate me, but the 11th is just a fun hole to play. In many ways it’s like a puzzle, there is just as much satisfaction in the process of solving it as there is the final result. I’ve rarely been one to play multiple balls on a golf hole, but the 11th at Greywalls makes me want to experiment and tinker until I figure it out. Marquette Golf Club has both a driving range as well as a short game area. Neither is gargantuan or what anyone would call “tour quality”, but both are perfectly fine to get warmed up before one’s round. My first time playing Greywalls was the day after several inches of rain fell the prior day, overnight, and then into the next morning. It rained so much that not only was the morning round canceled because it was still pouring outside, I thought for sure the scheduled afternoon round would be impossible to play. Thankfully for us, it stopped raining around 10 am. I still assumed our 2 pm round was in jeopardy due to the sheer amount of rain that had fallen. Not only did we play as scheduled, there was practically no evidence of the downpours that had deluged the area overnight and into the next morning. As should be evidenced by my photos, the course conditions themselves are simply gorgeous. Craig Moore and his staff do an amazing job of keeping the course in tiptop shape. I am hard-pressed to find anything about the conditions to complain about. As of 2017, the in-season rate for 18 holes and a cart was $130. 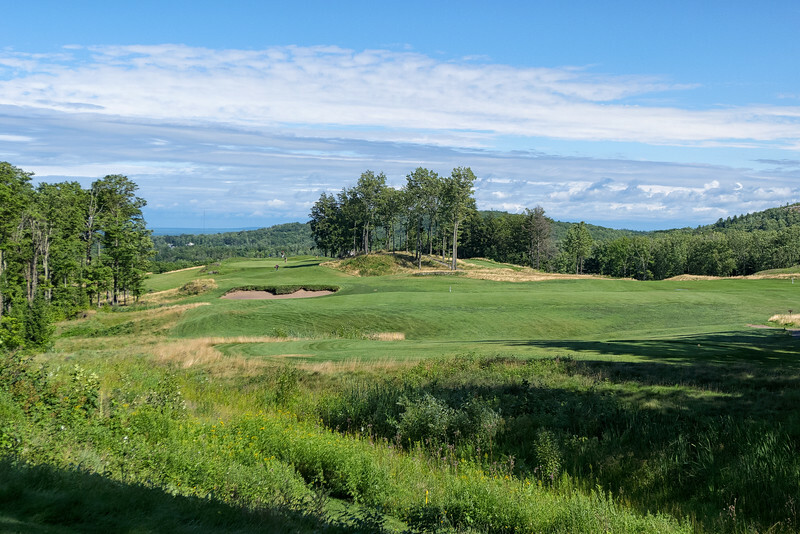 While not exactly cheap, Greywalls compares favorably to other high-end public courses in Michigan such as Arcadia Bluffs at $190 and Forest Dunes at $149. The best value at Greywalls probably comes from the $50 replay rate because you’ll definitely want to go around this track again. In case it’s not abundantly clear, I am a huge fan of Greywalls. While I usually like to give my Birdies and Bogies to each course I rate to highlight the good parts of a course and nitpick about details. In this case, I think it would be a disservice to my review. What the facility does right offers a fantastic routing on an amazing piece of land. Everyone that I interacted with couldn’t have been nicer. It’s just a fantastic experience on every level and I can’t wait to get back there, hopefully sooner rather than later. At the 9th, taking on the bunker on the left makes for much easier approach, while bailing out right makes for a well-earned GIR. If you liked the photography in this post, click here to go to my website to view the full resolution images. All photos are available as prints or contact me for usage rights.